Shhhh, Rami Malek and his fake teeth wouldn’t mind the conflation of the two bangin’ tunes in this headline. 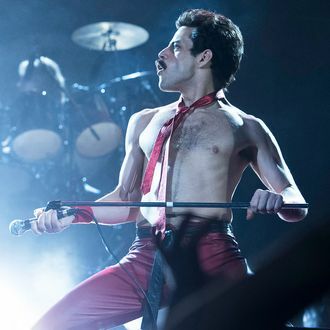 Despite its rather chaotic journey to the screen, the Queen biopic Bohemian Rhapsody won this weekend’s box office by bringing in $50 million in the domestic market. EW reports that these figures significantly exceeded the film’s projected ticket sales, a fact that makes us wonder which band Hollywood will next deem worthy enough for a music biopic: Tom Petty and the Heartbreakers? Talking Heads? Steely Dan? All of the above? Anyway, coming in second place in the box office was The Nutcracker and the Four Realms (a.k.a the one with Keira Knightly’s cotton candy hair), which brought in $20 million, while the Tiffany Haddish-fronted Nobody’s Fool netted third place with $14 million.